If you love dogs, just hanging out with a dog will make you feel good. This is the basic idea behind therapy dogs. They work as healing companions for people with cancer, PTSD, and dementia. There more than 50,000 therapy dogs in the U.S., and they are becoming increasingly popular in other countries, such as Norway and Brazil. Trained and certified by a variety of organizations, their primary responsibility is to go into hospitals to interact with patients. 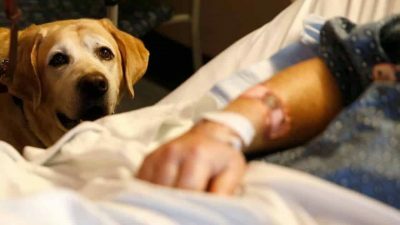 The benefits of therapy animals are real, as confirmed by research. But what do the therapy dogs think of their jobs? Science considered this question and the results are comforting. A recent study published in Applied Animal Behaviour Science reports that the therapy dogs they studied were not stressed out by their work, but in fact enjoy them. 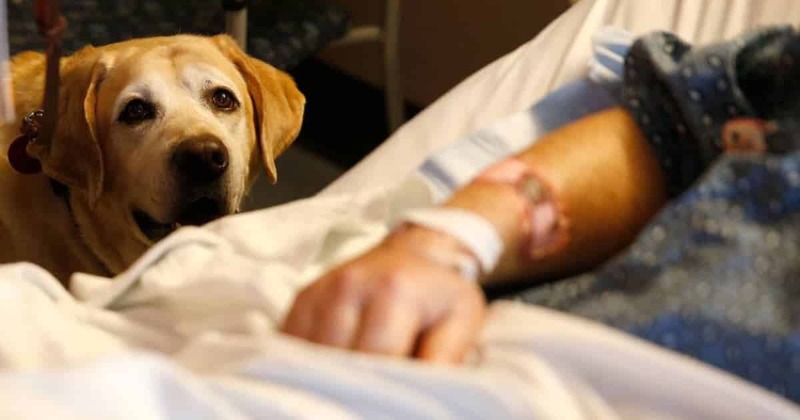 They studied therapy dogs specifically in pediatric cancer wards. 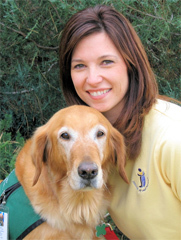 “What made this study unique was that it was multisite—it took place in five different hospitals across the country—and the fact that we visited over a hundred patients and 26 dogs participated, making it the largest of its kind in this field,” says study leader Amy McCullough, national director of research and therapy at American Humane, a Washington, D.C.-based animal welfare organization. To see if the dogs were stressed, the scientists tested for cortisol levels in their saliva. The swabs were taken while the dogs were working and at home. The problem is that cortisol can be used to measure both positive and negative stress. “Let’s say we have a dog that loves to play ball—when the ball comes out and the dog starts chasing the ball, that would elevate the dog’s cortisol levels as well,” McCullough says. To overcome this difficulty, the team also videotaped the dogs and analyzed 26 behaviors they split into three categories: friendly, moderate stress, and high-stress. There was no difference in cortisol whether the dogs were at home or at work. This means therapy dogs aren’t particularly stressed at work. The next question is whether the dogs actually enjoy their work. This new study provides a new hint. Certain dogs seemed happier during some activities. For instance, a child talking to them or playing with them made them happier than brushing or drawing. “…it’s fair to say that some activities are more fun for the dog,” McCullough notes. This requires watching the dog for what they like. This will help people choose the best therapy dogs. “Does the dog solicit attention, or does the dog need to be bribed with treats to interact?” she says.